OLD TAPPAN – The strategy is clear: get the ball to either Anthony Contreras or Joe Moon, Northern Valley/Old Tappan’s pair of senior midfielders, and then get forward. The Golden Knights are the rare high school side that employs three strikers and Contreras and Moon, both in their third seasons as varsity starters, always have their heads up looking to send one of them in on a run. So far, the Knights have played two games and have two wins to show for the efforts, including Wednesday’s 6-1 win over Indian Hills. Old Tappan had four-different goal scorers in a five-goal first half in which the Knights applied the pressure from the get-go. Six minutes in, Aiden LaMorte was pulled back by a defender while both were chasing a bouncing ball near the top of the box. Contreras got to line up a free kick from the middle of the field from just 19 yards out and he hit a skipper past the wall that Indian Hills keeper Robbie Pringle went low and to his right to keep out. Pringle made the initial save, but Mike Pankauski redirected the rebound into the empty net to make it 1-0 and the Knights poured it on from there. Luke Hennessy made six saves in the second half for Indian Hills. Quinn Scherer shouldered past a defender and ran onto a through ball played up the right side by Yoon and then deposited Old Tappan’s second goal inside the opposite post in the 10th minute. Scherer headed home a LaMorte corner kick five minutes later to make it 3-0. He saw his chance at a hat trick clang off the post on another header midway through the second half, but a two-goal day and a two-win start to the season was plenty of consolation. Scherer, a senior who is up from the JV after an injury slowed his progression last year, has fit right in to a multi-pronged attack based on applying constant pressure on an opponent’s backline. There were certainly more goals. Contreras dished out the last of his three assists by picking out Darin Yun making a run up the left sideline. Yun had time to take the measure of the on-rushing goalkeeper before choosing the lower right hand corner to put the Knights up 4-0. Then, will less than 30 seconds to go in the half, Old Tappan put together a quick counter attack after an Indian Hills restart at the other end of the field. 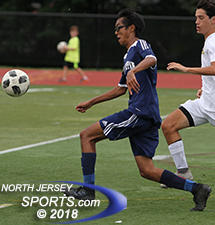 Darin Yun had a goal and an assist for Old Tapan, which will play Pascack Valley on Friday in an interesting early season tangle. This time it was LaMorte that had out run the last defender and he got off a shot that Pringle knocked down, but the rebound bounced right back to where it came from and LaMorte had an easy tap in to make it 5-0 at the break. Indian Hills broke up the shutout midway through the second half when Ben Coffman was taken down inside the penalty area. Matt Pillari converted the penalty kick with 23:38 left in the game. Old Tappan added its final tally in the 69th minute on a goal set up by Darin Yun, who finished with a goal and an assist. Old Tappan had five different goal scorers and four different players that added assists led by Contreras’ three. Moon and LaMorte also added helpers for the Golden Knights, last year’s North 1, Group 3 state sectional champion and a Bergen County Tournament finalist. 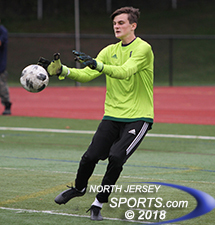 With nine seniors and two juniors in the starting lineup, with promising sophomores like Mangano and Jack Jaeger finding their legs on the varsity level and with a team chemistry strengthened by a preseason road trip, Old Tappan figures to be right in the mix again for league county and state sectional titles.